Classroom Building at Ray City School. The white wooden classroom building was already an old building on the campus when Diane Miley attended second grade at Ray City School in 1939.
central north-south hallway ran through the building. On the east side were two big classrooms for the 1st and 4th grades, and a small room used as the Soup Kitchen. On the west side were 2nd Grade and 3rd Grade classrooms. There were no bathrooms in this building, or in the main brick school building for that matter. The toilets at that time were outdoor toilets. the Ray City school did not get indoor toilets until after WWII. 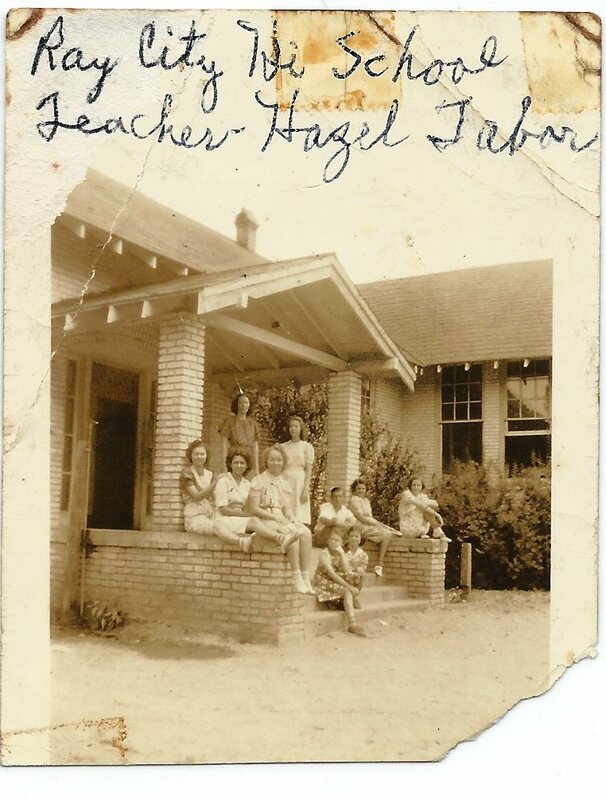 Other Ray City teachers around that time were Jesse Francis Webb, Hazel Tabor, Dorothy Chisholm, and Mary Peele, James Garland Grady. Julius Glen Tatum was an Ag teacher. This building housed the original “soup kitchen” lunch room at Ray City School. Off of the 4th grade classroom was a small room which was used as the lunch room. It measured about 10 feet by 12 feet and was equipped with a cook table, but no sink counter. A big cast iron wood-burning stove occupied one corner of the room. There were counters and benches along two walls where the children ate. The lunchroom ladies could not feed many children at a time. The charge for lunch was 10 cents, but not all children could afford to get a hot lunch. Many brought their lunch from home and ate in the school yard. Mrs. Hun Knight worked hard to bring the soup kitchen to the school and worked in the kitchen. Mrs. Eula Swindle Hall was the first cook. She was followed by Mrs. Allie Purvis Starling. Leila McConnell also cooked. Martha Burkhalter was a lunchroom “waitress.” Agnes Knight Guthrie also helped in the kitchen. For the paying students, soup was served every day, with brown whole-wheat flour biscuits and butter. The kitchen was supplied with surplus government commodities supplemented with fresh produce that was brought in by local farmers in trade for their children’s lunches. Rossie Futch brought in sweet potatoes in trade for a hot lunch for his children. Later, after the first school cafeteria building was constructed on the Ray City School campus in 1941, the small soup kitchen was turned into a trigonometry classroom for the high school students. 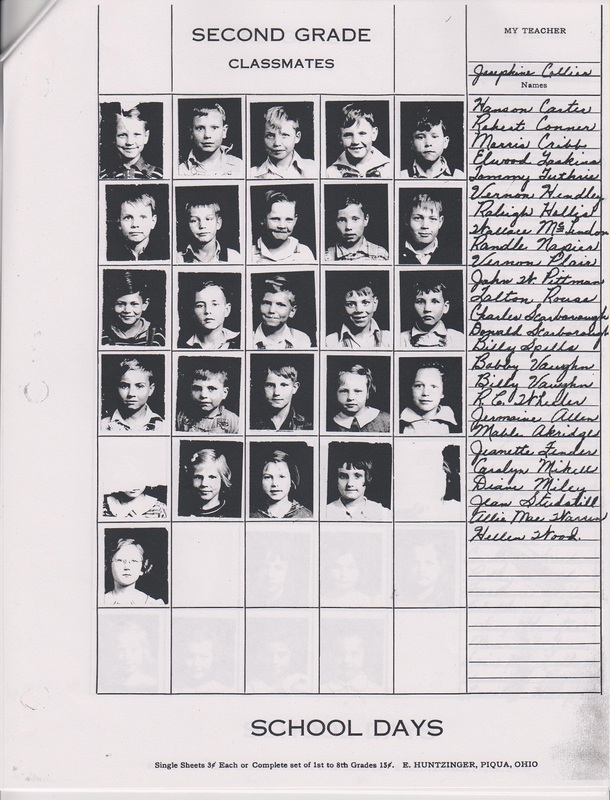 School photos and yearbooks add to the documentation of family locations between census enumerations. 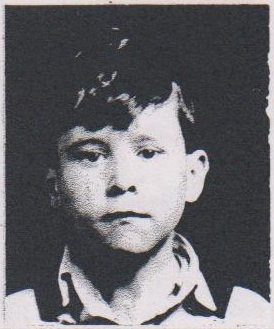 In 1939, Tommy Guthrie attended second grade at the Ray City School, Ray City, GA. His parents were Perry Thomas Guthrie and Rachel Mae Taylor, of Ray City, GA. A page from the 1939 yearbook provides photos of most of his classmates. Principal of the school was Prentice Munson Shultz. Tommy Guthrie, 1939. Grade 2, Ray City School, Ray City, GA.
Jermaine Allen, Mable Akridge, Jeanette Fender, Carolyn Mikell, Diane Miley, Jean Studstill, Allie Mae Warren, Hellen Wood. The Ray City high school Glee Club was featured in last Sunday night services at the local Methodist Church, singing before a packed house. Reverend J.O. Stanaland, pastor, announced that it was nearly a capacity congregation. The Glee Club very ably and with pleasing harmonious voices rendered a group of chorus selections. There are twenty-eight mixed voices in the Glee Club. The Ray City High School Glee Club numbering twenty-four voices, presented a program last Tuesday morning at the Lakeland School auditorium during chapel period. Several readings were also given by students representing the Ray City Expression Department. The performance received an enthusiastic response from the Lakeland faculty and student body. Mr. House praised the work of the visiting group, and stated that on account of the pleasant scholastic relations in literary and athletic events which had always existed between Ray City and Lakeland he was exceptionally glad to have had the Ray City school represented here on such a delightful an occasion. Similar programs were presented in Ray City last fall by Lakeland High School and Grammar School Glee Clubs prior to the School of the Air Broadcasts. The Ray City Glee Club is preparing a program to be broadcast over radio station WAYX in Waycross at 2 o’clock p.m. April 7. – Lanier County News. In 1939 the Ray City School Glee Club gave a Christmas Cantata with many students and teachers participating. Ray City School, circa 1949. The school building was originally constructed in 1922. Ray City High School Glee Club will present a Christmas Cantata, “Memories of Bethlehem,” (Holton), on Wednesday evening, December 20, at 8 o’clock in the high school auditorium. The glee club will be assisted by Miss Josephine Collier, pianist; contralto, Mrs. Rudolph Zeigler (Martha Ernestine Cantrell Ziegler); soprano, Mrs. Garth Webb, and Miss Hazel Tabor. Peggy Carter, Annie Ruth Clements, Juanelle Clements, Marjorie Garner, Frencholyn Guthrie, Myrtle Hendry, Alma Luke, Evelyn Moore, Victoria Sirmans, Pauline Skinner, Juanelle Starling, Carolyn Swindle, Allen Yaun. Roy Carter, Hugh Clements, Hubert Comer, Billy Guthrie, Morris Johnson, Bruce Knight, Harold Moore, Ronald Parrish, Hubert Starling, Jack Vickers, Lamar Weaver. Lamar Hardy, Fain Guthrie, Ferrell Herring, Barbara Swindle, Annie Martha Grisset, Lois Burkhalter, Kenneth Cameron, Billy Creech, Casswell Yaun, Bob Starling, Sadie Griner, Wylda Starling. Ushers for the occasion will be Helen Scarboro and Betty Garner. Candle lighters will be Robert Martin, Rudolph Scarboro, Bill Gray, Harvey Wood. Wise men will be Hilda Sirmans and Doris Mobley. 1939 Class Seniors, Ray City School. Miss Tabor, Teacher. Pictured are Annie Ruth Clements, Elizabeth Weaver, Mona Faye Swindle, D’Ree Yawn, Hazel Sirmans, Doris Forehand, and J.D. Carter.